With over 140 year’s experience, Sherwin Williams Automotive Finishes is the number one name in vehicle refinishing and one of the worlds leading manufacturers of automotive refinishing products. Supplying colourful, durable coating systems complete with warranty and technical information to customers worldwide. The Automotive Finishes segment develops, manufactures, and distributes various motor vehicle finish, refinish, and touch-up products. 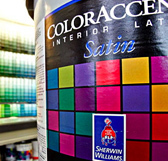 It also licenses certain technology and trade names worldwide, as well as distributing Sherwin-Williams branded automotive finish and refinish products through its network of automotive branches.